Version 4.7 is now out. "Windows 98, NT, 2000, XP or Vista; we believe Windows 7 poses no problems, although we have not yet done extensive testing on that platform. Please note that Windows 95 is NOT supported." v4.63 is out. The developer is working on v5, which is said to have improved IMAP support. Not entirely portable adds various keys to the registry. Search using 'Pegasus Mail' in regedit and you'll see. I find it very full free email client as long as you don't use IMAP. IMAP with Pegasus mail is way too slow. Please DO correct me if I'am wrong, and also GUI glitches appeared from time to time. Just saw this last statement today. You're somewhat wrong J44xm. Pegasus Mail does support languages of different "alphabets", like Hebrew (LTR), Russian, Korean and Japanese (can't swear as I don't speak any of them), even in late versions. After adopting Unicode (among 26 other charsets) it extended its support much further. Besides this charset thing, there's nothing out there that matches Pegasus Mail power and functionality. It's the One mailing system, not just a mailer. Pegasus Mail's support for Japanese seems to be quite poor. Also, development on it has stopped. There's a nice guide by Harri Nykanen at http://www.nykanen.org/PmailUSB/index.php for WinXP SP2. I believe it can be easily adapted to XP SP1 and Windows 2000. Other Pegasus Mail "must-view" websites are Han's Personal Site (http://www.vandenbogaerde.net/) and Rob's Pmail Portal (http://email.arcm.com/news.php. Enjoy both! Pegasus is a very nice mailer. Version 4.41 supports a command-line option: "-ROAM" meant to support serverr-installs and USB-sticks. Look it up in the help-file. 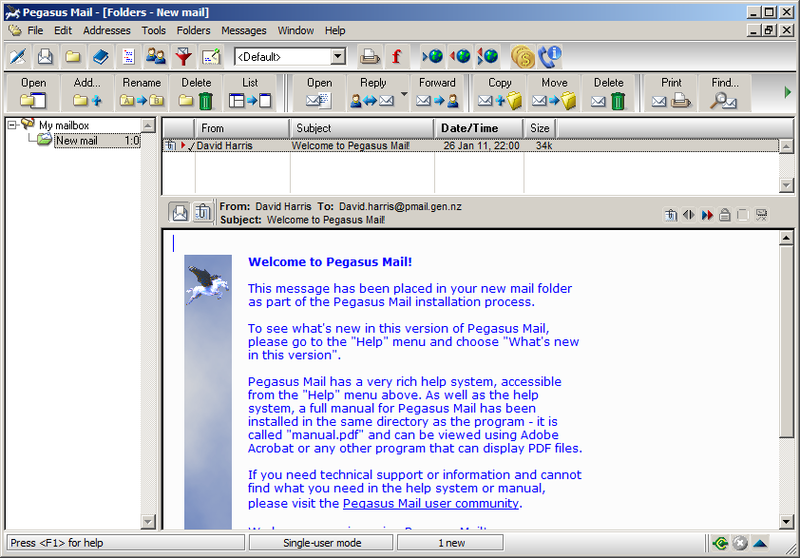 Pegasus Mail, a really excellent E-Mail-Client. There are also german and french versions available! Thanks! I have updated the version number and synopsis. You data on Pegasus Mail is outdated. Application is now on v4.41 which major improvement is a built-in bayesian spam filter.